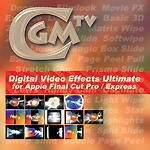 NEW: Now you can purchase the CGM Digital Video Effects for Apple Final Cut Pro X and Motion 5. Look Familiar? Does this plug-ins and the CGM name seem familiar? That's because you already have some of our tools! 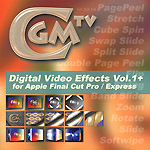 CGM DVE Vol.1+ (the old version of this plug-in package, v1.0) was included with Final Cut Pro 3 and Final Cut Express. You'll find them listed as "FXScript DVE's" in both the Video Transition and Video Effects menu's of the Effects palette in Final Cut. Don't see them? Maybe you didn't install them when you installed Final Cut. Insert your Final Cut Pro 3 or Final Cut Express install CD, launch the Final Cut installer for your OS, and choose the optional "FXScript DVE's from CGM". You don't have to reinstall Final Cut itself. DigitalFilm Tree uses our CGM DVE Ultimate plugins collection in their tv productions Scrubs and Cougar Town. Thanks to being written in FCP's "native language" all CGM transitions and filters function seamlessly, fully supporting YUV rendering, 10bit YUV, 32bit YUV and RGB as well as multiprocessing in OSX. Furthermore they are designed to render at the subpixel level, ensuring smooth movement within the rendered clip. A final advantage is that the 2D and 3D effects are actually "true" FCP transitions rather than After Effects filters (which may require cutting and pasting and often suffer from luminance shifts as they do not render in YUV space). All plug-ins support all frame rates in standard and high resolution video (up to 1920 x 1080) and the Intel processor and RTExtreme HD architecture of Final Cut Pro and Final Cut Express. And of course rendering is optimized for maximum speed on all available Apple computers (Motorola, IBM and Intel). Now we can offer you five single volumes of plugins and CGM DVE Ultimate which includes all five volumes in one package. Purchase the CGM Ultimate at the price of 399 USD and you'll save over 52%! New Service: Order the CD version with credit card and you can download the software immediately! Start using the plugins straightaway while the CD is on its way by airmail. 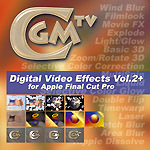 The "CGM DVE Ultimate" is a set of 229 filters, transitions and generators for use in Final Cut Pro and Final Cut Express. In addition to the professional plug-ins, the package also includes a series of Final Cut Pro workshops and 68 softwipe patterns. CGM DVE Ultimate contains all available CGM plugins in one package. These are the volumes CGM DVE Vol.1+, CGM DVE Vol.2+, CGM DVE Vol.3+, CGM DVE Vol.4+ and CGM DVE Vol.5+. The video burns out like film. This Movie FX animation is only available on the CGM DVE Ultimate CD-version. The updates from a old CGM DVE collection up to version v6 are available as single updates. And if you upgrade to CGM DVE Ultimate Collection you can get the updates for your existing plug-ins and the new plug-ins at a cheaper price by using your old CGM DVE order numbers. Future updates are entirely free and you can download them from our server by using your login and password (orders since 12-01-2009). Over the last few years we were not able to send automatic updates to customers because most e-mails were blocked by spam filters. 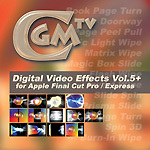 The "CGM DVE Vol.5+" is a set of 44 filters, transitions and generators for use in Final Cut Pro and Final Cut Express. In addition to the professional plug-ins, the package also includes a series of Final Cut Pro workshops and 68 softwipe patterns. The filters to look out for are the "Doorway", "Invert Wipe", "Prisma Slide", "Prisma Wipe", "Radar Wipe", "Mystic Light Wipe", "Magic Box Slide", "Spin 3D", "Burn-In Wipe" and "Blur Bar" effects. 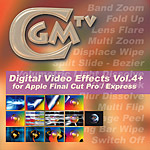 The "CGM DVE Vol.4+" is a set of 49 filters, transitions and generators for use in Final Cut Pro and Final Cut Express. In addition to the professional plug-ins, the package also includes a series of Final Cut Pro workshops and 68 softwipe patterns. The filters to look out for are the "Lens Flare", "Split Slide - Bezier", "Displace Wipe", "Band Zoom ", "Fold Up", "Blur Wipe", "Multi Flip", "Multi Zoom", "Volumetric Light Dissolve " and "Video Look" effects. 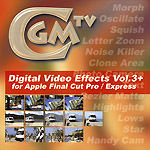 The "CGM DVE Vol.3+" is a set of 64 filters, transitions and generators for use in Final Cut Pro and Final Cut Express. In addition to the professional plug-ins, the package also includes a series of Final Cut Pro workshops. The filters to look out for are the "Morph", "Clone Area", "Bezier Matte", "Text", "Countdown", "De-interlace", "Highlights", "Lows", "Cube 3D", "Squish" and "Star" effects. The filters to look out for are the "Film", "Light/Glow", "Selective Color Correction", "Explode", "Zoom/Rotate 3D", "Area Blur", "Color Glow" and "Wind Blur" effects. Stop Press: Check out the big screen! Some of this plug-ins were used for the DreamWorks feature film Envy. If you already use the first collection of these must-have plugins, you'll definitely want this new release which is an upgrade of the FXScript DVE's. - Extended cropping enables very powerful compositing capability. 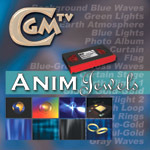 - The CGM 3D shadow system gives videos a really cool 3D look. - Automatic gap recognition makes effects work with logos and titles much easier. - All plugins now support Alpha channels - also important when you add effects to keyed logos or titles. - All plugins support the new Intel processor and RTExtreme technologies of Final Cut Pro and Final Cut Express. - Effects which change the size of the video now include a high quality scaling algorithm. - Two bonus plugins: CGM Film Dissolve and CGM Match Color. High definition Earth-Animations delivered on DVD as JPG image sequences (1980x1080 / 25/30p). Can be used on all HD editing systems with a image sequence import function. We used 8k earth maps to render these high quality 3D animations. 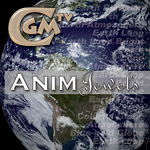 Professional movie studios can use these animations without paying any additional fee. High quality 3D-Animations delivered as QuickTime movies on DVD-R to use in your own productions (DV NTSC, 720x480 / DV PAL, 720x576). Can be used on all QuickTime compatible editing systems (list). Superior technical quality animations and fantastic motion effects, fitting the needs of both prosumers and professional production companies. The collection ranges from a wide variety of 3D transitions and opening animations to specific themes such as weddings and travel, as well as elegant animated backgrounds for your own titles. Do you have any special suggestions for effects? Send us an e-mail and we`ll include the best requests in the forthcoming package "CGM DVE Vol.6+". We are looking for distributors all around the world. You are welcome. Final Cut Pro and Final Cut Express are trademarks of Apple Computer Inc.